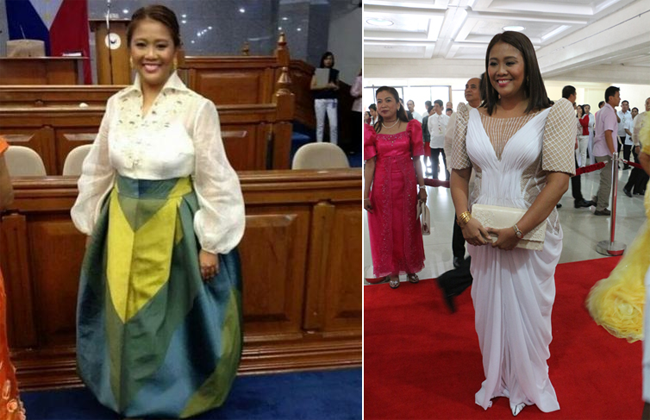 There are so many people who noticed Nancy Binay’s outfit during the State of the Nation’s Address (SONA) and according to her, she is not affected by the bashers and she promised to be more adventurous when it comes to her outfit next time. Binay said that when it comes to fashion, we should be adventurous and it means to say that something more will come in the near future that we should watch out about her. The maker of Binay’s gown was Randy Ortiz and she did not regret wearing it, in fact, she has a plan to collaborate again with the designer with regards to her outfit on the next SONA. Well, Nancy seemed unaffected by her bashers. After the SONA, there were memes that emerged wherein she was regarded as Princess Fiona and she only laughed at them. She also said that it has become her favorite since the princess came from the movie Shrek. According to her, she has a personality called “NR” or no reaction and she was glad that her children were not affected by the issue and she doesn’t have the time to respond to any criticism. Well, Nancy did it. A very positive approach to bashers. She did carry herself in such a way that she is very comfortable and whatever may be the outcome of her wearing the dress, she will not regret about it. Way to go Nancy Binay!